The Kalislof river is a glacier fed river system that drains out of lake Tustumena and dumps into the upper Cook Inlet. 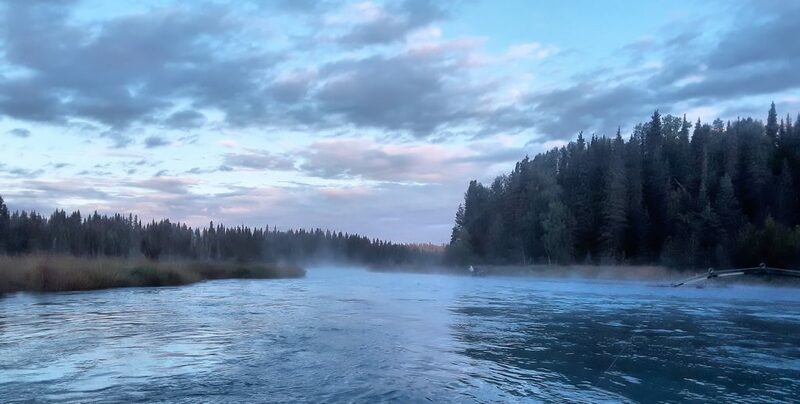 Approximately 20 miles in length the Kasilof is one of Alaska’s great fishing destinations, with opportunities for several species of Salmon and Steelhead. The most sought after are the healthy runs of chinook, coho, and sockeye but the Kasilof also gets runs of pink salmon, chum, and steelhead. Be aware the trout and steelhead retention is not allowed on the Kasilof making it a catch and release affair. Pinks run every other year but are considered more of a nuisance than a targeted species. Pinks run the same time of year as Coho which can make it more difficult to catch the coho that are a far more desirable species due to the exceptional flavor coho offers at the dinner table. Chum are another of the lesser targeted species and are not in as significant numbers on the Kasilof as other Alaska tributaries. Still in the late fall chum can be caught on Kasilof. The Kasilof gets both spring and fall runs of Chinook, Coho and Sockeye ,as well as winter steelhead. **See Akaska fishing REGS for exact times. This fishery generally allows up to 10 jack salmon per day but only 2 may be adult chinook with a limit of 5 adult chinook per year. Regs also indicate on certain days of the week wild chinook retention is allowed. 3 Coho salmon over 16 in per day allowed. 10 per day for all salmon any species under 16 in. Remember to always check with Alaska fish and game in the event there are rule changed affecting bag limits. **See Alaska fishing REGS for details. Artificial lures are required in certain areas of the Kasilof during certain times of the year, be sure to check you reg book. herring, shrimp, and salmon roe are among the most effective baits for salmon fishing. See Regs for specific times bait is allowed. Natural scent work best like salmon egg, various bait fish, and shrimp. See Regs for specific times scent is allowed. Pulling plugs is effective as well as drifting roe. Also throwing hardware like spoon and spinners. Hand to Hand. The Kasilof, as with most excellent fishing rivers in Alaska, is full on combat fishing, eye protection recommended!